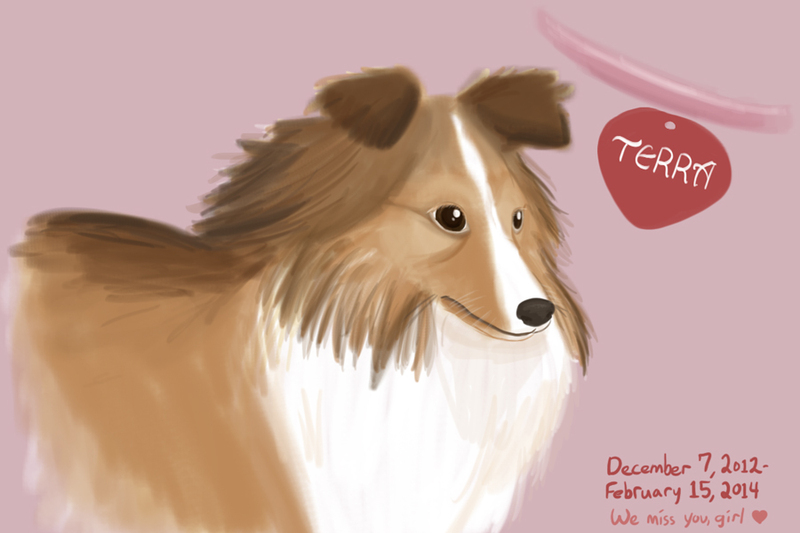 Terra was a beautiful Shetland Sheepdog that brought an incredible amount of joy into our lives. This weekend, her life was tragically cut short after wriggling out of her collar and getting hit by a car. I feel that I want the world to know how much our sweet puppy meant to us–she was a symbol of unconditional love, a boundless ball of energy that always was thrilled to meet people. We hope she’s happier where she is now, and Sarah and I look forward to meeting her again one day. I’m sorry, but BitF will be taking the week off and will resume next Tuesday. I don’t feel very funny right now. Incidentally, if any of you have ever had to cope with losing a pet and have any sort of advice or condolences for dealing with the immense heartbreak, we’d be very comforted to hear what you might want to say to us in this thread, or at staff (at) brawlinthefamily.com. We’re comprising a scrapbook of Terra memories and are trying to cope. Thank you very much. We love you, Terra. Try not to pester God too much without us.